There is no doubt that Chief Minister Ali Rustam has done his bit towards developing the state of Malacca. Malacca is no longer that sleepy backwater tourist anachronism that it was a decade ago. Ali Rustam, however, appears to be hallucinating when he declared Malacca a developed state. It must have caused amazement, if not amusement, around the world. It is one thing to make a claim; it is quite another to substantiate it. The whole question of what constitutes a “developed” state is apparently quite murky as there are no clear-cut criteria set by the UN or even the Organization for Economic Cooperation and Development (OECD) which is generally considered the club of rich nations. Technically, therefore, any country can claim tittle to “developed” country status. In practice, the general understanding is that developed country status is based on per capita GDP. The World Bank identifies 66 “high income” countries. The International Monetary Fund has 34 countries on its list of “advanced economies.” Newsweek’s Quality of Life Survey, 2010, lists 30 countries as top-tier. Malaysia, unfortunately, did not make any of the above lists and therefore, it would be reasonable to conclude, is not considered a develop state. Unsurprisingly, the OECD representative, quickly disassociated his organization from the Chief Minister’s claims. Within Malaysia, according to our Statistics Department, Malacca with a GDP per capita of RM22,761 (2009 figures) ranked 7thth after Kuala Lumpur FT, Sarawak, Penang, Selangor, Labuan FT and Negeri Sembilan. This means that if Malacca can claim developed nation status, so can six other states in Malaysia. So, all of a sudden we might have a profusion of developed states within a developing state. An unusual state of affairs to say the least. Perhaps Bukit Mertajam, my hometown, might now be able to declare itself one of the world’s great cities. It all seems like smoke and mirrors to me, a cheap publicity stunt to take credit for a phantom achievement. 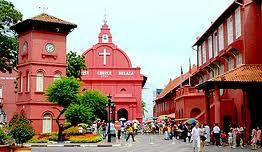 Malacca, having lost its claim to fame centuries ago, must be desperate for attention. The real question is does the Chief Minister think that the Malaysian public is so gullible that they will be impressed by such a phony claim? Try again, Chief Minister, in another fifty years time perhaps.